When I first got it, the husband was picking up the diapers that I’d ordered and was turning them over and checking them out for his own first impressions cloth diaper review. 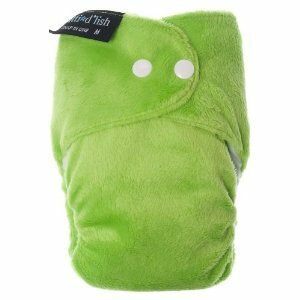 When he picked up the lime green Bitti d’Lish, he compared it to a Muppet. And really, it is sort of Kermit green. As for construction, I have to admit that once I took it apart and started looking at it, it made me sort of nervous. It has a lot of qualities that reminded me of the BumCheeks diaper, which I find to be completely ineffective and have banished from my cloth diaper stash. 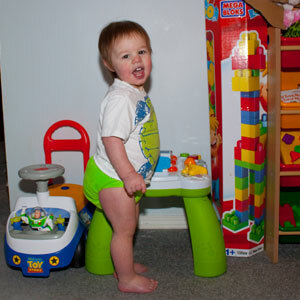 The BumCheeks is one of two cloth diapers that I’ve used that I absolutely hate and would never encourage anyone to buy. But, hey, I spent decent money on this diaper, and I was bound and determined to give it a try. Besides, it’s also really cute. Fit: This is awesome fit on Norton. However, it does seem to run a bit small. At 26 pounds, he’s on the largest setting of the large diaper, so I’m quite certain that it will not last Norton until potty training. If you’re looking for a trim diaper, though, this is not the one for you. It’s actually a rather bulky diaper that I would not put under Norton’s pants. Quite frankly, if I did, I think I’d have to put him in jeans a size bigger to allow for the bulk of this diaper. Effectiveness: No leaks. At all. Even when I left Norton in his diaper for way too long because I got side tracked, it didn’t leak. Great diaper. There are also options for adding doublers under the built in flap for super heavy wetters, but Norton is a heavy wetter and it managed him fine. I’d probably want to use a doubler for overnights, though. However, if Norton had diarrhea or any other form of poo grossness, I don’t think this diaper would contain it. Laundering: With this being an all-in-one diaper (and soft and fuzzy to boot), I thought for sure that this would take forever to dry. I was pleasantly surprised to find that it actually dried just as fast as my pocket diapers, and faster than my hybrid inserts. After several washes and uses, the diaper is still just as soft now as it was when we took it out of the package. However, with the doubler flap built in, cleaning out solid waste (even with a diaper sprayer) isn’t quite so fun. In a nutshell: This diaper is super cute, fun, and easy to use. It’s definitely a keeper in my stash.